Do you come here often??? Sounds like a cheesy pick-up line, right? Well, in this particular case, it is and it isn’t. The reason I ask is because if you do, you probably already know that baking homemade bread is a true passion of mine. I love everything about it, especially the end result as you can clearly see with this Braided Challah Bread! It’s so, so pretty!! I’ve seen many a Challah breads before and I have always been smitten with that deep brown, glossy sheen they all sport. To me they always look like some master bread artisan must have toiled away for hours and hours getting them to that perfect state of delectable brown bliss, and as much as I enjoy working with yeast breads, I doubted that I, a humble home baker, could pull off the perfect looking Challah that would be worthy of a bakery window or, dare I say it, magazine cover. 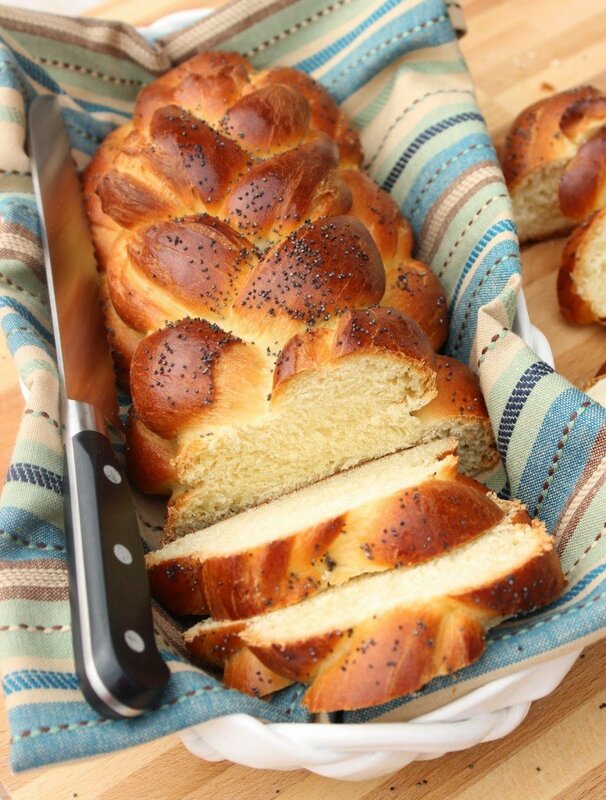 I am especially thrilled that the “Back To the Future Buddies” bread group chose this as our April recipe, otherwise I might not have tried my hand at making my own braided Challah, and found out just how easy it is create a beautiful looking (and tasting) loaf! It truly is a spectacular bread so if you’re on the fence at all about trying to make your own, please just go for it. Your success is right around the corner. I promise! Makes: 1 large, or two small loaves Prep Time: 2 1/4 hours (including rise time) Bake Time: 30 min. -Combine 1 1/4 cup flour, sugar, salt and yeast in a large bowl (I used my stand mixer bowl). -Mix in the softened butter and the warm water. -Use the dough hook (or wooden spoon) to blend thoroughly, making sure to scrape down the sides of the bowl from time to time. -Separate the yolk from the white from one of the eggs, and set aside the one yolk for later use. -Stir the 3 eggs and one egg white into the dough mixture, one at a time. -Stir/knead in the remaining flour, 1/2 cup at a time until the dough is smooth and elastic (approximately 5-7 minutes) *Note – if you’re making this on a humid day, the additional flour will be required. -Place the dough in a greased bowl and cover it with plastic wrap in a warm draft free place to rise until doubled in size (approximately 1 hour). -Once risen, punch the dough down and turn it onto a lightly floured surface. Divide the dough into 4 portions (if making 2 loaves) one slightly smaller than the other OR two portions, again, one slightly smaller than the other. -Using the larger portion of dough, divide it into 3 equal pieces and roll each piece into a long snake. -Place the three roll out snake pieces next to each other on a parchment lined baking sheet and pinch the ends of one end together. -Starting at the pinched end, braid the three dough ropes together and once complete, pinch the ends of the dough to finish. -On a lightly floured surface, take the smaller portion of dough and follow the exact same braiding technique. *Note – this braid will be slightly smaller than the first one. -Using a little water and a pastry brush, brush a light bit of water on the base braid and then carefully lay the smaller braid on top of the base braid. -In a small bowl, whisk together the egg yolk and 1 teaspoon of water. -Gently brush the egg wash completely over then entire loaf and sprinkle with poppy seeds (if desired). -Allow the loaf to rise again until doubled in a warm, draft free place (approximately 1 hour). -Bake the Challah in a preheated oven for 30 minutes or until it deeply golden brown in color. 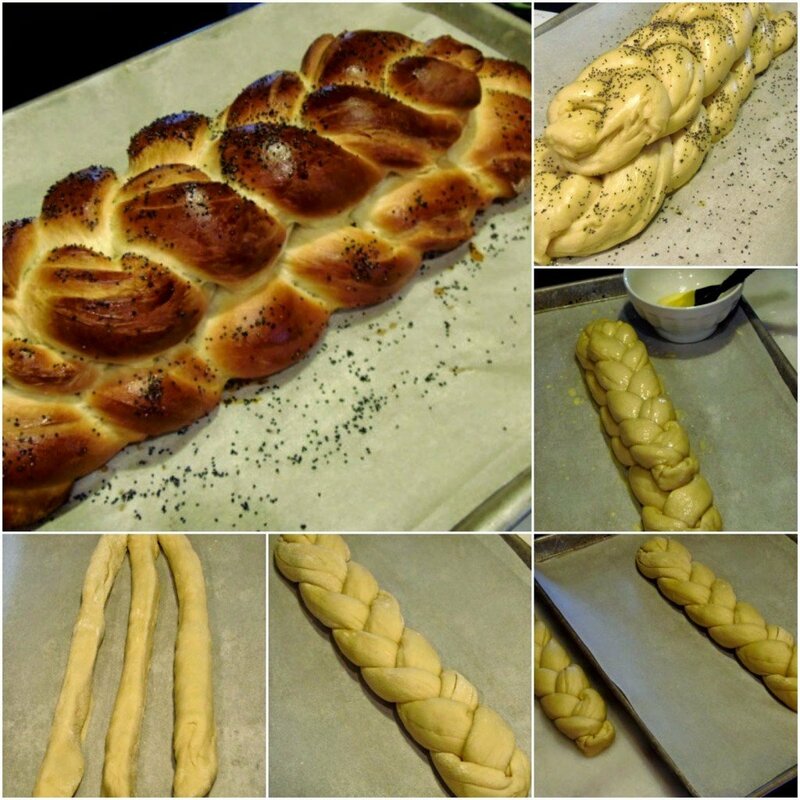 While I generally prefer to make my challah non-dairy, I'm definitely going to try your braiding technique. I am woefully braiding-impaired, but your method appears to yield a gorgeous looking loaf! Thanks! My pleasure, Renee. It was a lot simpler than the complete loaf appears to be. Let me know how it works for you. I just saw this on Pinterest, via Reeni/Cinnamon Spice. I can't WAIT to try it! You've made what I always thought was a complicated bread look relatively easy! Thank you! Thank you for telling me about the Pinterest board and I'm glad you found it there. I just know you're going to love this bread as much as we did here! Most definitely worthy of a magazine cover (loving the tea towel/fabric as well)!! Beautiful loaf, beautiful pictures (and it tastes soooo good…..). 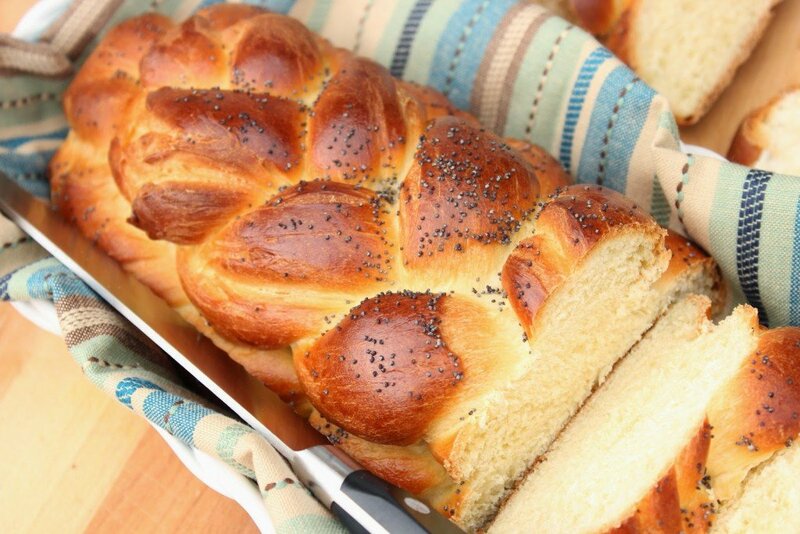 Thank you so much for baking along Renee., you've braided a wonderful Challah! (I knew everybody was going to love it – impossible to resist, wasn't it). Hope you'll be tempted now to braid the 6 strands as well, using "my" other recipe. Let us know, which one you loved most. Kudos for the wonderful pictures. It was my pleasure, Carola. I doubt I'll get to the 6 strand Challah anytime soon so this one will have to be my favorite for now 🙂 Thanks so much! I've just finished admiring your challah hot dog. Wonderul! Wow nice and soft bread, thanks this recipe.Chef i can baked without eggs. 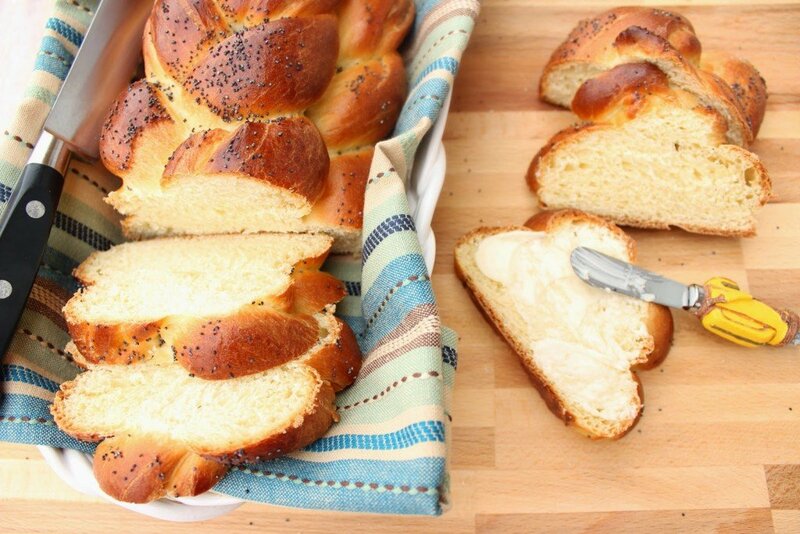 Absolutely gorgeous Challah Renee! 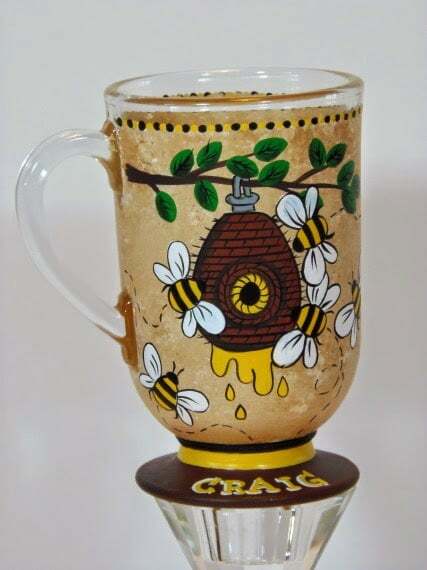 It does make great French Toast, looking forward to your post on that recipe!